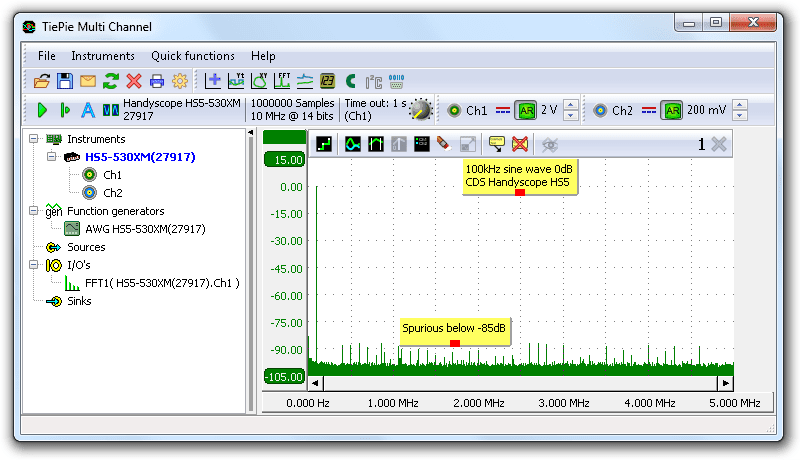 The Handyscope HS5 is the first High Resolution USB oscilloscope with built-in 30 MHz low distortion function generator. The built-in Arbitrary Waveform Generator uses CDS signal synthesis technology, developed by TiePie engineering, resulting in the best signal fidelity in its class, generating the true form of your signals. With spurious distortion as low as -85 dB at 100 kHz signal frequency, a very flat amplitude spectrum and a rise time of 8 ns, the low distortion function generator creates signals that approach perfection. Figure 1: Handyscope HS5 function generator sine wave with extremely low spurious. Combined with an output voltage of 24 Vpp, a resolution of 14 bit at 240 MS/s and a waveform buffer of 64 MSamples, this makes the Handyscope HS5 Arbitrary waveform generator truly a high quality low distortion function generator. Standard signal shapes like sine wave, square wave, triangle, pulse, DC and noise are available. When a custom signal shape is required, this can be created in the 64 million samples large memory or by loading a previously measured signal from the oscilloscope.